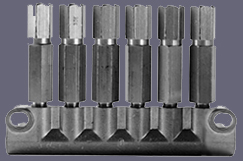 The Bijur ZJBM injector is designed to be used with PDI type systems. The maximum operating pressure is 34 Bar (500 psi). The discharge volume ranges from (0.01~0.40cc).